The National Pesticide Information Retrieval System (NPIRS) State Public website contains information pertaining to pesticides either currently or previously licensed for distribution and sale in the United States and is provided for informational purposes only. States that provide current pesticide registration data are searchable in four ways including active EPA registration number, product name, company name, and active ingredient. The Accepted Labels State Tracking and Repository (ALSTAR) application developed by NPIRS provides access to the electronic pesticide labels for the products registered in states. ALSTAR states are identified by a star. 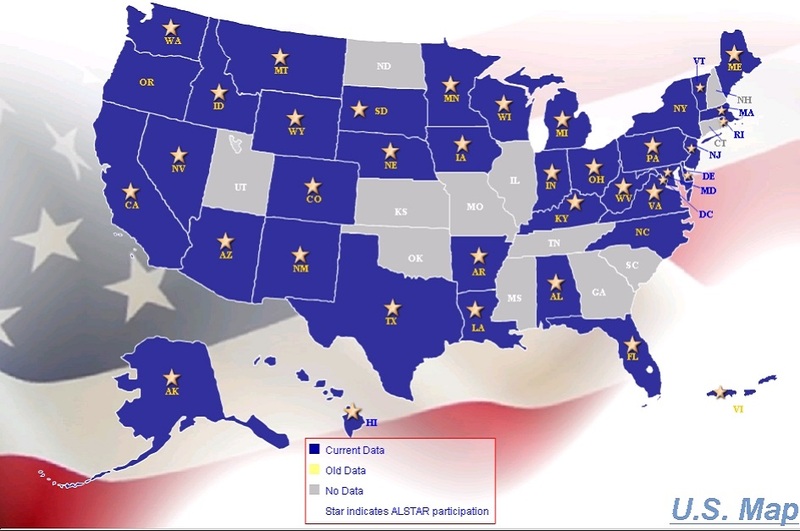 Blue ALSTAR states have current data in NPIRS. Red ALSTAR states have data considered to be old and therefore are not searchable. Yellow states have current data in NPIRS but do not participate in ALSTAR. Lastly, gray states do not provide data to NPIRS and are not searchable. If your state's registration data is not searchable, contact your state agency and request that they send their current pesticide registration data to NPIRS. There is no charge to the states to be included on this website. To search a particular state's pesticide registration data, click within the state's area on the map.